Association of REALTORS, SFR, Short Sales And Foreclosure Certification. and approved for their SFR, Short Sales & Foreclosures Resource designation. websites, and included in the SFR Members-Only Networking site. these complex types of real estate transactions, skills and negotiations. 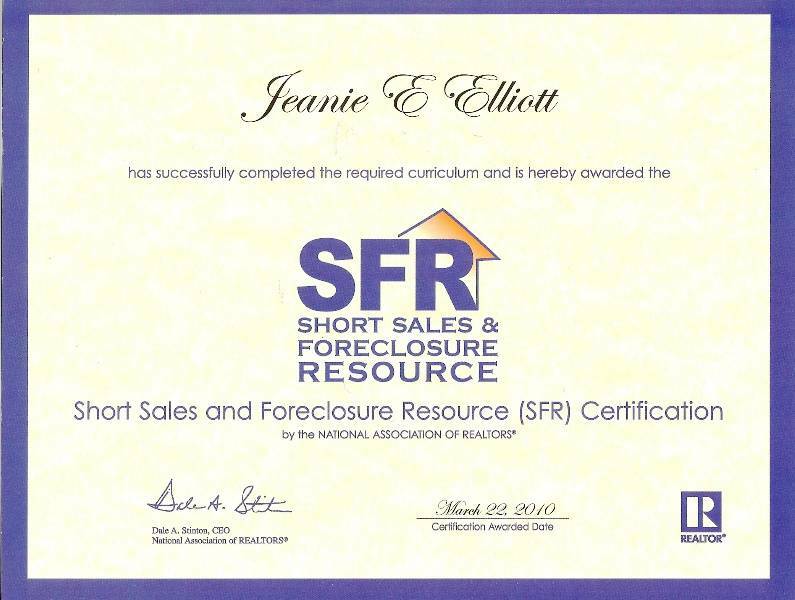 Allen, Plano, Frisco, Texas, March 22, 2010 — Jeanie E. Elliott with Jeanie Elliott REALTORS has earned the nationally recognized Short Sales and Foreclosure Resource certification. The National Association of REALTORS® offers the SFR certification to REALTORS® who want to help both buyers and sellers navigate these complicated transactions, as demand for professional expertise with distressed sales grows. The certification program includes training on how to qualify sellers for short sales, negotiate with lenders, protect buyers, and limit risk, and provides resources to help REALTORS® stay current on national and state-specific information as the market for these distressed properties evolves. To earn the SFR certification, REALTORS are required to take one core course and three Webinars, and pass a written exam with high score. For more information about the SFR certification, visit the National Association of REALTORS' website at http://www.realtorsfr.org/ or call Jeanie Elliott, Jeanie Elliott REALTORS in Allen, Frisco and Plano, Texas, at 972-612-2277 to discuss how her services can be of benefit to you in the purchase or sale of bank-owned, REO's, and foreclosed properties and homes for sale. Ms. Elliott has also now received the ABR Accredited Buyers Representative designation awarded by REBAC, the Real Estate BUYER'S AGENT Council of the National Association of REALTORS, and is offering specialized buyer representation in addition to her special training and certification as a SFR Short Sales and Foreclosure Resource for her clients that want to buy and sale bank-owned, foreclosed properties, short sales and REO's, and desire the services of a REALTOR that offer both areas of specialization in these types of complex transactions.